Shin Ha Kyun & Han Suk Kyu – See You in Talk Show? Can we see the king who loves the people and thinks for the people, and Lee Kang Hoon who both hands grabs medical skill and ambition in talk show entertainment program? The producers of variety shows are buzzing in full swing in order to invite Han Suk Kyu (48) and Shin Ha Kyun (38) to join their programs. 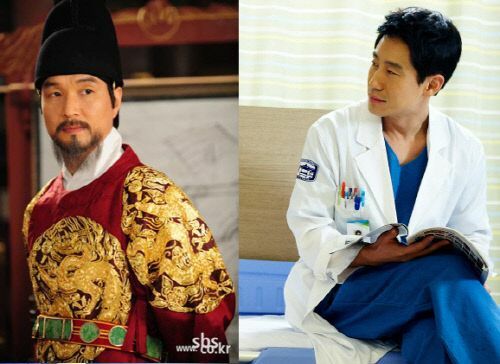 Han Suk Kyu of SBS’s Deep Rooted Tree (A Tree with Deep Roots) who returned to small screen after 16 years, and Shin Ha Kyun of KBS2’s Brain who returned to small screen after 8 years, have won the Daesang (Grand Price) Award of 2011 SBS Drama Awards and 2011 KBS Drama Awards repetitively, and successfully begin their second golden age. And the viewers of these two TV stations have been hoping that they can participate in talk shows.